Regular check-ups are an important tool in managing diabetes—whether you are feeling great or not. Check-ups measure your overall health, provide education and guidance on diabetes self-care, and help you to prevent and treat diabetes complications. Depending on your overall control, you may be asked to come in for a check-up once or twice a year. If you are experiencing any complications, you will need to be seen more often. In addition to seeing your primary doctor, you may also have to see other specialists. The A1c test will tell you your average blood glucose level over the course of a three-month period. Making sure that your A1c is in your target range helps you keep your risk for complications lower. The American Diabetes Association (ADA) recommends an A1c of less than 7 percent, while the American Association of Clinical Endocrinologists (AACE) advises an A1c of less than 6.5 percent. The normal range for people without diabetes is between 4 percent and 6 percent. People with prediabetes fall between the range of 5.7 percent to 6.4 percent. Blood tests can show how your kidneys are functioning. Creatinine and BUN are waste substances that are dumped into the blood by cells for excreting by the kidneys. When the kidneys aren't working as well, these can build up in the blood, forcing levels to rise. If your kidney function tests are coming back abnormal, your primary doctor may refer you to a nephrologist. Why check your cholesterol? Because people with diabetes are twice as likely to develop heart disease. Glucose in the blood can slow down the LDLs ("bad" cholesterol) which makes them sticky. This causes cholesterol to build up much faster on blood vessel walls. Cholesterol-lowering medications are usually prescribed earlier for people with diabetes to prevent complications of heart disease. Elevated LDL and triglycerides increase the risk of developing heart disease and atherosclerosis. Additionally, lower HDL levels can also be problematic. If your cholesterol levels are out of range, your physician may suggest that you make dietary changes, lose weight, exercise, or in more significant cases, take medication. If there are other issues related to your heart, you may be referred to a cardiologist. High blood pressure is known as the "silent killer." 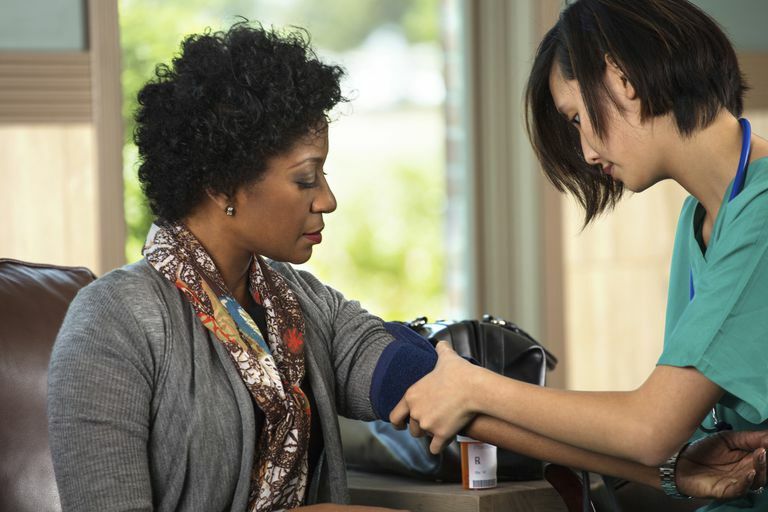 People with diabetes tend to have trouble with high blood pressure, too. Having both diabetes and high blood pressure can cause an increase in the risk of heart disease, stroke, and eye, kidney, and nerve complications. Blood pressure medications keep the risks down. Additionally, eat a diet that is lower in sodium and includes more nutrient-dense foods, which are rich in vitamins and minerals and can help to reduce risk. Decreased circulation and changes in the blood vessels of your feet and lower legs can cause serious problems. Even though you should check your feet daily for fungus, nail and toe deformities, cuts, sores, or infections, your healthcare provider should also assess them at your check-up visit. A microfilament or tuning fork exam can detect decreased sensation to asses the risk of neuropathy (loss of feeling in the feet). Neuropathy, decreased circulation, and poor blood glucose control can inhibit the ability to heal cuts and sores. If cuts and sores become infected, the complications can be devastating. The risk of gangrene increases as circulation becomes compromised and the body can't fight off infection. Amputation of the affected limb is often the result. A foot exam can help you to keep your feet healthy. If your physician notices an issue such as a fungus or a foot deformity, they can refer you to a podiatrist. If you have a history of peripheral arterial disease, your legs are swollen, red, and you have foot issues, your physician may recommend that you see a vascular surgeon for further workup. Everyone with diabetes should have a comprehensive eye exam at diagnosis and, if no issues are found, they can see an ophthalmologist again one to two years later. When blood glucose levels remain too high for a long period of time, changes can occur in the tiny blood vessels that supply the retina of the eye. This is called retinopathy. Damage isn't always easy to detect, so getting your eyes checked regularly can help spot trouble before it gets out of hand. If retinopathy is not treated, it can lead to blindness. Any time that you notice strange blotches, blurriness, or dark spots in your vision, you should make an appointment with an eye doctor immediately. Protect yourself against developing diabetes complications by making your ongoing diabetes check-up appointments. Most people with diabetes should see their primary doctor, an ophthalmologist, and a podiatrist, and sometimes are also referred to an endocrinologist (a doctor who specializes in diabetes). If you are experiencing other complications, you may be referred to other specialists. American Association for Clinical Chemistry.Diabetes. Lab Tests Online. National Institute of Diabetes and Digestive and Kidney Diseases (NIDDK).Your Kidneys and How They Work. National Kidney and Urologic Information Clearinghouse (NKUDIC). American Heart Association.What Your Cholesterol Levels Mean. Can Walking Help Regulate Your Diabetes? What Is Diabetic Neuropathy and What Causes It? How Does the A1C Test Reflect Your Diabetes Care?